Smartphone Database Query for Excel (Database Viewer Plus) allows to view and query Excel spreadsheets and databases from Smartphone devices. Excel and database data can be filtered, sorted or complex SQL queries run via an easy to use interface and the numpad. Smartphone Database Query for Excel is ideal for employees or sales representatives that require important corporate or enterprise database information while on the road or out of the office. Write SQL Select query to create PDB having contents of two or more tables based on relationships. View Excel, Access, Oracle, FoxPro, dBase an any ODBC compliant database. View database tables as a whole or one record at a time. Easy browsing and navigation facility with operations which can also be performed via numpad keys on Smartphone. 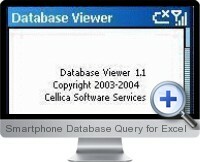 Smartphone Database Query for Excel is also available for Blackberry, Palm and Pocket PC.